Welcome to the inaugural edition of Middle Relief, our midweek look at news and nonsense from around the majors. When Scott Podsednik jogged to center field in the eighth inning of Tuesday night’s game against the Orioles, he thrust the Red Sox into rarefied air. No, he didn’t win the game for Boston — Baltimore walked away 4-1 victors. No, he didn’t change Boston’s place in the standings — the Sox remain cellar dwellers and below .500, the longest they’ve gone without topping .500 in 15 16 years. In making his first appearance in a Red Sox uniform, Podsednik became the 12th player to man their outfield this year. Injuries, a few lousy performances by fill-ins, and then even more injuries have wreaked havoc on Boston’s preseason outfield plans. The four projected starters (two full-timers and a platoon) are all on the disabled list. One top prospect who figured to fill the void has also been out all year. Reinforcements have been brought in from other teams. And in his latest attempt to overcome baseball’s nastiest string of injuries, Bobby Valentine made lifetime first baseman Adrian Gonzalez the new starting right fielder. How acute is Boston’s outfield problem? In the past decade, only two other teams have sent 12 different players to the outfield by May 22: The 2007 A’s and the 2002 Expos (hat-tip Elias Sports Bureau). Who are these 12 angry (or at least sore) men? Let’s meet them. Jacoby Ellsbury: Coming off a monster 2011 in which he had a strong case for AL MVP, the Red Sox expected Ellsbury to pace what figured to be one of the best, if not the best, offenses in baseball. But a nasty shoulder injury suffered April 13 has him likely out until July, after initial (premature) estimates of a six-to-eight-week absence. Ryan Sweeney: As much as the Red Sox would love to have Josh Reddick swatting home runs for them the way he has for Oakland this year, no one is complaining about Sweeney, who was considered a throw-in alongside Andrew Bailey in Boston’s offseason trade with the A’s. Even after cooling off following a torrid start, Sweeney’s still hitting .311/.341/.443 and still flashing the great defense people expected. Too bad he became Boston’s latest DL casualty Tuesday, hitting the seven-day DL with what’s being called a “mild” concussion. Cody Ross: Sweeney’s expected platoon partner, Ross has proven to be much more than that so far this year, hitting .271/.349/.534 and emerging as one of the biggest steals of the offseason, given his one-year, $3 million free-agent contract. Unfortunately, a broken bone in his left foot landed him on the DL alongside Sweeney. Darnell McDonald: McDonald is walking more, striking out less, and hitting for more power than he did last year, when he posted a not-terrible .704 OPS operating mostly as a platoon player. A plunging batting average on balls in play has knocked McDonald down to an abysmal .179/.277/.357 this year. Nate Spears: Now-27-year-old organizational soldier called up to provide bench depth after Ellsbury’s injury, Spears appeared in four games (two in the outfield), racked up four at-bats, struck out in three of them, then got shipped back to the minors. Marlon Byrd: When they acquired him a month ago from the Cubs for Michael Bowden and a throw-in, the Sox hoped Byrd could fill the team’s gaping hole in center field, reversing an ugly downturn in his numbers that started with a .695 in the second half last year and accelerated into pure ugliness in the first couple weeks of this season in Chicago. Now 34 years old, slower in the field and with his bat, Byrd sits at .203/.235/.242 for the year. Jason Repko: A light-hitting center fielder known for making acrobatic catches, Repko made one of the best ones of his career on April 20, lunging after a ball in the gap to take away an extra-base hit. Unfortunately for Repko and the Sox, he also slammed into the wall in left-center on the play, injuring his shoulder. Lars Anderson: Once an elite first-base prospect, Anderson’s prospect sheen faded with a series of unimpressive minor league batting lines, leaving him in the role of Triple-A shuttle rider and fill-in. Called up to replace Repko, Anderson played in just six games (four in the outfield), garnered just eight at-bats, then got sent back down. Che-Hsuan Lin: Initially called up after the Ellsbury injury, Lin played in one inning of one game, got sent back down, and didn’t make it back to Boston until last weekend. A walks-and-steals guy who was rated best outfield arm in the organization by Baseball America, Lin made his first major league start on Monday and stroked his first big league hit. Daniel Nava: You could have a room full of Jeter posters, a Yogi tattoo on your face, and two kids named Bucky and Boone and still admire Nava’s incredible journey to the big leagues. A late bloomer of the highest order, Nava played at 4-foot-8, 70 pounds as a high school freshman. He gained size and strength as he matured (he’s still on the short side at 5-foot-10, but weighs a solid 200), and developed into an on-base hound in the minors. Given a chance to play regularly with everyone from Bangor to Providence on the DL, Nava’s hit a robust .324/.471/514 in 51 plate appearances. Even when Boston gets everyone back, it’s hard to imagine the Sox not finding room for Nava as a backup and ace pinch-hitter. At the very least. assuming a plague of locusts doesn’t suddenly descend on Fenway and wipe out the rest of Boston’s still-healthy outfielders. Adrian Gonzalez: Gonzalez appeared in just three games in the outfield over his entire career before Valentine installed him as the starter in right against the Phillies, an apparent nod to interleague play and Valentine’s interest in cramming David Ortiz into the lineup. But when the Sox traveled to Baltimore to resume their DH-infused existence, Gonzalez remained the starter in right, allowing the Sox to play Kevin Youkilis and big-power/lousy batting-eye rookie Will Middlebrooks at the infield corners. Though the Sox would surely do better defensively with Gonzalez at his natural position of first base and, say, Lin patrolling right field, Valentine’s going for offense instead, hoping Middlebrooks’s prodigious pop can negate his 25-to-3 strikeout-to-walk ratio. The gang of 12 doesn’t include former All-Star and current $142 million man Carl Crawford or Ryan Kalish, Boston’s top outfield prospect who was expected to vie for big league playing time this year; neither player has played a single game in the majors in 2012. The pessimism over Boston’s start has been overblown. After a horrendous first few trips through the rotation, Red Sox starters have pitched very well lately, with everyone from Golfgate whipping boy Josh Beckett to previously untested starter Felix Doubront chipping in. The offense continues to produce, with Dustin Pedroia steady as ever, Ortiz putting up big numbers, and several role players such as Sweeney, Ross, Nava, and Jarrod Saltalamacchia hitting well. Ellsbury, Crawford, and Kalish are all due back in July, Bailey’s on the mend, Youkilis is finally back and healthy, the core of a very good team’s still there, and an extra wild-card spot’s up for grabs. If the Red Sox aren’t up to 112 outfielders used a month from now, they could still be contenders this season. Norris isn’t the most valuable asset the Astros have on their major league roster. That would be Jose Altuve, the 22-year-old lilliputian second baseman with less than a year of service time who’s hitting above .300 and starting to add a little pop. Houston’s second-most valuable commodity might be Norris or 28-year-old Red Sox castoff Jed Lowrie, depending on your optimism (or lack thereof) over Lowrie staying healthy. Basically a two-pitch pitcher, Norris has parlayed his fastball-slider combination into the 14th-best strikeout rate in baseball this year, ahead of luminaries like CC Sabathia and even Justin Verlander. On a team sorely lacking in building blocks, he’s one of the few the Astros have. It’s easy to look back at stats on a page, parse the stats a pitcher can supposedly control (strikeouts, walks, home runs, ground ball rate) from those he supposedly can’t (batting average on balls in play, strand rate), and in hindsight make a sweeping statement about what a team should have done with that player. Coming up with the Astros, Paulino was a big strikeout pitcher who got creamed by all of those supposed luck stats. Obviously the Astros should have been patient and waited for his luck to turn around. But that’s a much easier decision to make from 30,000 feet than it is from the dugout. In 2009, Paulino’s first full(ish) season with the Astros, the right-hander struck out 8.6 batters per 9 innings, vs. 3.4 walks; he also got crushed for 126 and 20 homers in 97 2/3 innings and posted a 6.27 ERA. We can probably attribute some of that to luck: Paulino gave up home runs on 16.9 percent of his fly balls that year, stranded just 67.6 percent of the runners he put on base, and served up a BABIP of .361. But it’d be a bit naive to just wave all of that away as random chance. Paulino was a rookie trying to learn how to get major league hitters out. His pitch selection was probably lousy at times, as was his location. He might’ve lost his cool on occasion with runners on. We can’t just chalk up a year’s full of meatballs entirely to the vagaries of the universe. Paulino played a role in his own crapulence. When the same problems plagued him the next season (5.11 ERA) and in 18 terrible outings for the Rockies (7.36 ERA), both his employers let him go. Whether it’s luck finally working in his favor, the 28-year-old Paulino finally learning how to pitch, or, more likely, a little of both, he’s finally emerged as a quality starter in Kansas City: 8.9 strikeouts and 3.3 walks per 9 innings over 150 innings with the Royals, for a 3.96 ERA. He’s been much better than that since coming up in early May this season: 10.3 K/9, 2.5 BB/9, 0.4 HR/9, 1.42 ERA, 2.01 FIP over 25 2/3 innings. Maybe the Astros and Rockies, two of the pitching-neediest teams in the game, should have waited on Paulino. But when real people get involved — frustrated managers, pissed-off fans, antsy GMs — patience can evaporate. Better to credit the Royals for taking a flyer on a talented pitcher who drove his bosses crazy. and ended up catching back-to-back home run balls. Lloyd had never caught a ball in his life prior to Monday’s two-fer. But he had no plans to keep either one: Zack Cozart’s home run ball went to the buddy who’d offered him a spare ticket. Mike Leake’s home run ball went right to the Reds pitcher, since Lloyd wanted him to have the keepsake for his first major league bomb. Did he have to give the two balls away, though? We already had our annual big debate on ballpark etiquette last month during CryingKidGate in Arlington, so it’s probably not worth rehashing the whole “give the ball to the kid” argument; there are valid arguments to be made in favor of keeping a ball for yourself, and for giving it to someone else — besides, I already guilted Craig Calcaterra into giving away a foul ball this spring, so my work here is done. But I do have one thought that needs to go on the record: If you catch a home run ball hit by the other team and throw it back, you’ve made a huge mistake. You’re not keeping a souvenir after pulling off a once-in-a-lifetime feat. You’re not making some kid’s year by handing the ball over. Nope, better to show you’re a true fan, give in to the drunken masses, and chuck the ball back on the field. You, hypothetical sir, are history’s greatest monster. 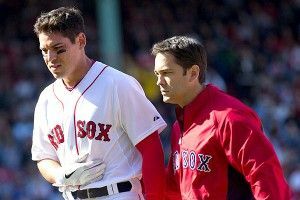 Turns out Berkman has a torn meniscus, not a torn ACL, knocking him out an estimated six to eight weeks instead of all season. It’s a blow to the Cardinals, who now turn to 23rd-round pick turned mashing behemoth Matt Adams at first — along with replacements for Jon Jay, Allen Craig, and Chris Carpenter, who hasn’t thrown a pitch for the Cards all year. The 12 minutes when it looked like Berkman might retire raised an interesting question, though: Is Lance Berkman a Hall of Famer? I’m with Dave Cameron on this one: If Berkman retired tomorrow, he would likely get lumped in with Edgar Martinez and Todd Helton, only with lesser counting stats, and thus fall short of induction. To be clear, I think Edgar’s résumé is Hall of Fame–worthy, even if voters apparently don’t. Helton is right on the borderline; I probably wouldn’t vote for him, but certainly wouldn’t begrudge others who did. Berkman was an elite hitter for the first 10 full seasons of his career, never posting a Weighted On Base Average below .383 during that stretch, and putting up the following career numbers: .409 OBP (36th), .546 SLG (31st), 146 OPS+ (47th). Playing at hitter-friendly Minute Maid Park, in a hitter-friendly era, without any big career counting stats (359 career homers, 1,836 hits), with zero MVPs (he was never robbed of one, either), should and will leave him short. No worries, though, Lance. If that doesn’t work, we’ve got a plaque in The Hall of Very Good with your name on it. Another 0-for-4 night for Davis Tuesday, dropping his season line to a brutal .156/.212/.291. CBS’s Jon Heyman reported before Tuesday’s game that Davis had a few days to a week to start hitting again or he could face a possible demotion to Triple-A. FanGraphs’ Bill Petti, one of my favorite baseball analysts these days, has a great piece on how the league’s pitchers have adjusted to Ike Davis, throwing him far fewer fastballs this year than they did in years one and two of his career. The piece goes on to explore how pitchers as a whole adjust to young hitters, and finds a similar pattern, particularly for hitters entering their third season. It’s well worth a read. Of course, even if we place much of the blame on Davis and assign significant credit to NL pitchers, we can’t ignore the influence of some bad luck. Davis’s BABIP dropped to .183 Tuesday, down from .321 and .344 in his first two seasons and second-lowest in the majors. As with Paulino, though, Davis can’t dismiss all his struggles by playing the luck card. If the Mets do send him down, a few weeks of adjustment — and adjusting to pitchers’ adjustment — might do him some good. Feast your unbelieving eyes on Casilla’s at-bat for the ages, then tell me: Has any batter ever looked worse in the batter’s box than Casilla did Monday night? The answer to this question is: Yes, at least one hitter in major league history has looked worse with a bat on his shoulder. His name? Santiago Casilla. By standing further away from the plate than anyone would have ever thought possible, spinning away in terror at times, hacking fecklessly at others, Casilla is the most persuasive argument fans of AL baseball can make in favor of the DH. On the other hand, Casilla kept a 14-inning game lively long past the point at which even most die-hard Giants fans would have packed it in, and gave us one of the biggest laughs of the season. Too late to change him to a THREE UP?